Arakou stumbled through the dense underbrush somewhere in the central part of the Crescent Forest. This was Nibenese land, at least according to the Shadow-King. That proclamation did little to ease the fear that was gnawing at the defiler’s gut. In actuality, this was a no-man’s land, controlled by small clans of halflings who were native to the area. Neither Gulgan nor Nibenese usually travelled these woods, but Arakou’s duties as one of the Shadow-King’s defiler’s brought him here. Now he was alone, his guards and servants killed and probably eaten, by now, by the halfling savages. The defiler took a moment to drink from a small stream. As he bent down, the twang of a bow string, quickly followed by the pain of a small arrow shaft, alerted him to the presence of the halflings. Luckily the arrow didn’t seem to be poison, as was often the case. Halfling’s rushed out from the forest shouting in their high-pitched language. Arakou knew this was it, life or death. The defiler pointed his palm down toward the ground and opened himself to Athas. When Arakou took energy to power his spells, the rush of life was always a pleasurable experience. This time went far beyond that. Arakou was filled with an ecstasy he had never experienced as he drew energy from the pristine forest and felt the abundance of energy at his disposal. Even though he had plenty of energy to power the spell, he drew more power, as the plants around him withered and turned to ash instantly. The halflings stumbled as life energy was pulled from them as well. Arakou used the momentary nausea of the halflings to blast an arc of lighting that jumped from one savage to the other. 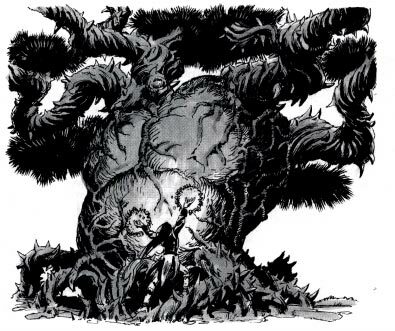 As the lighting struck each halfling in turn he heard pops and sizzles as the halflings’ internal organs exploded. After the halflings fell to his overpowered spell, he quickly cast a spell to see if there were any more savages in the area. Even though he had defiled a large area with his spell, the land still gave him a surge of energy that he used to expand the range of his detection spell. There were no more halflings in the vicinity. He couldn’t rest here though; surely the forest predators would smell the burnt flesh and investigate. He moved on, heading north east, hoping to find a logging road to make the going easier. The rare remaining forests of Athas offer great rewards to arcane casters who cast there. Within these forests there are verdant paradises where life energy can be easily drawn from the land to power spells. To those used to drawing Athas’ energy from the wastes, these lush forests offer power unimagined. Effect: Arcane casters can tap into the forest’s energy to over-power their spells. Usage: In an ancient stand of trees or a particularly pure spring, life energy pools in great reservoirs.